It all began as a series of daring accretions starting last December. Now, Tent City in Sydney’s Martin Place has become something of an institution, albeit of the fleeting sort. But this gathering of the homeless, rather than being considered a social consequence of galloping house prices and general cost of living, has been uneven in pulling heartstrings. To Brook’s credit, the rest of the piece rises from its initially unpromising dredges, sketching a few humane portraits. He takes note of Nigel Blackmore’s tent, located in the middle of this accumulating wonder. Then came divorce, the loss of a job, and the need to find accommodation. How mighty the high do fall. A community has gathered, generating its own rituals around economies of respect. The camp is clean, and various fire safety rules observed. Signs dot the camp about observing appropriate behavioural standards; alcohol is (supposedly) prohibited. Bringing cups for the gratis food and drink is also encouraged. Within this speck of an ecosystem, located with thumbing defiance in front of Australia’s Reserve Bank, comes a concerned, desperate counter that is not entirely based on choice. Some who have left their spot on Martin Place find an option with walls, a cold residence as that of Sammy Migenta, who had been a Tent City resident for six weeks. A roof over a head is no guarantee of community, and Tent City, lacking fabricated structures and that solidity of permanence, has become homely, generating its own mores of comfort. The slew of responses to its continued presence vary, depending on whether it is a matter for New South Wales, or the City of Sydney. The ultimate aim is to dismantle it. The City of Sydney council has been none too impressed by affordability problem of the city. The New South Wales government is even less sympathetic. Pru Goward, the NSW Minister for Family and Community Services, feels that the government has been pulling its weight, with her department making dozens of visits to offer accommodation and services. The central premise is one that parcels out the commons in a specific way. The residents of Tent City are deemed offensive, their very presence a violation of an aesthetic sensibility. In what must count as part of the socially absurd, the NSW government has also expressed “safety concerns” over the presence of such items as bookshelves and a piano. What might a comfort for a Tent City resident is a barbaric discomfort for the housed, moneyed passerby. This logic was extended by Premier Gladys Berejiklian who introduced legislation that gives the authorities power to remove people or goods that constitute “unacceptable impacts on the public.” The grammatically tortured wording of the provision doesn’t detract from its ultimate meaning: the unbecoming, the ugly, unacceptable, will be removed, cast aside, buried. At this writing, the bill has passed, without amendments. As the Premier explained on August 2, it all had to do with comfort – and distinctly not the comfort of those who had found a safe space in a very conspicuous part of Sydney, away from wretched doorways and shelters. She was full of “concern” that “there were some people there who are not there for the right reasons”. Such stiff propriety! The blame, according to the Berejiklian government, is easy: Sydney Lord Mayor, Clover Moore. For her part, Moore announced on Monday that an agreement had, in fact, been organised with the self-styled mayor of tent city, Lanz Priestly, based on relocating residents to a 24-hour safe space. The Premier also registered her approval. When faced with the details, Priestly remained unclear, though Moore, through a City of Sydney Council meeting, has approved $100,000 towards the establishment of the safe space. The Australian, in the best traditions of the Murdoch press, was delighted to tell its readers that Priestly could not be trusted. He had a “criminal past”, as if that explained anything. This scrap focuses on an age old argument on how the commons are used. The fact that the unsightly is being punished, that a legislative response penalising conduct rather than socially redressing poverty, continues a long tendency in the approach of power towards the inappropriate, and those deemed threats to the order. In Melbourne, Sydney’s old sparring rival of a city, a war of sorts has been declared by Lord Mayor Robert Doyle against the ugly, the unseemly, the unclean. The rather naff notion came into being earlier this year: outlawing the very condition of homelessness itself. But for Doyle and his ilk, such a condition can itself be criminalised. Of 2,550 submissions on the proposed by-law, 84 percent were keenly opposed. An alternative, advanced by an alliance of 54 groups, suggested the establishment of safe spaces for the homeless to gather, secure lockers for storage, and pre-emptive intervention programs. 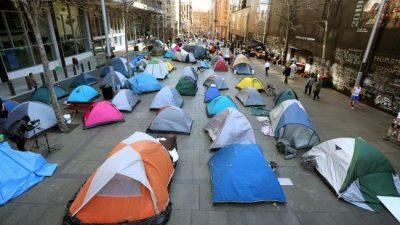 The latest focus, however, is on Sydney, and how Tent City will disappear into the ether of an invisible consciousness. The promise of closure, with the euphemistic language of cleaning, is a daily occurrence. Residents are already packing, ready for the quick departure. A community born; a community removed. Featured image is from The Australian.